Door hanger marketing really opens doors! Door hangers are automatically set apart from other junk mail since they’re next to impossible to ignore, and they’re extremely cost effective to print and distribute, so it’s no wonder that door hangers often achieve a high response rate. 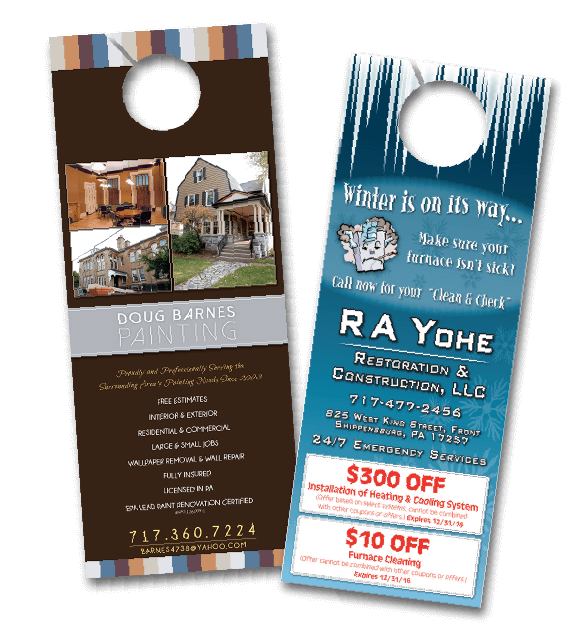 When done correctly, door hanger marketing can quickly become a staple of any campaign strategy. They come 3 ½” x 8 ½” or 4 ¼” x 11” and are printed on a 14pt coated or uncoated paper. Full color, single or double sided.